One of my biggest headaches, is cutting down plywood sheets, most of the time when I go to Homecenter, I ask them to be cut, and I will get some feeble response that they are too busy, but will have it ready for tomorrow, I am certainly not making two trips, with time, petrol and toll charges to pay, so I have been putting timbers on the ground to support the panels, and cutting between the supports. It works but it is fiddly, and the older you get the more uncomfortable it is. 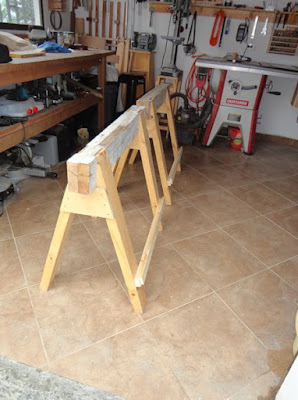 I can't afford a panel saw, and haven't got the space even for a DIY version, then the other day, a solution came along, using my saw-horses! You need two, and it just happened that mine were the right design for the method I saw. 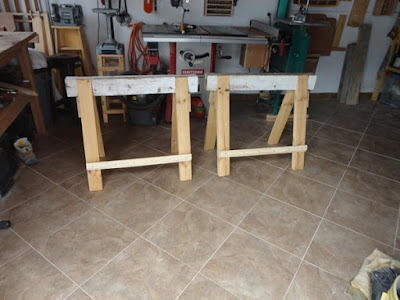 You just need to create an 'L' rail near the bottom of each saw horse, if you stack them, make sure the rail is low enough not to be a problem, mine are 6 1/2" from the ground, which allows enough room for my circular saw to start the panel. 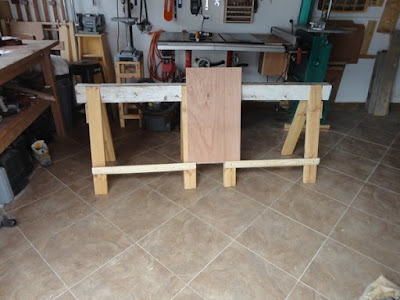 The rails themselves are 7/8" wide in order to take up to 3/4" sheets, with a 1/2" lip making the 'L' to keep the panels in place. As in the photo, space the saw-horses sufficiently apart to be able to cut up between them. Then place your sheet on the rail, with your cut line in the space, and away you go. If you are worried about movement, you can also clamp the panel to the saw-horse. Unfortunately, I haven't got any large leftovers at the moment, but you get the idea. The great thing about these is it is made of scraps, and in my case, just an add on to an existing accessory, which takes up no space.